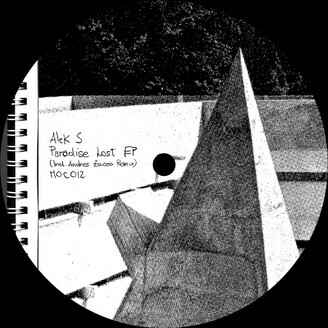 Alek S offers up another dose of pensive techno vibes in his “Paradise Lost” EP. Side A opens up with “Bold”, a slice of laid back while still pounding techno, boasting zippy synths with an unmistakable analog flavour. It’s closely followed by Andres Zacco’s rework of “Honey Wheat”, an apt reconstruction of the original that’s aimed squarely at the dancefloor. The Argentinian producer and recent Ilian Tape alumni dives in with a powerful groove, cutting its way through a suspended atmosphere full of spaced out sounds. Over on the B-side we’re greeted with “Paradise Lost”, a slow-paced melody that gradually shifts into a dreamy groove filled with spaced out drums and abstract delays. Last but not least, the original version of “Honey Wheat” is a somewhat atmospheric, yet functional floor warmer that fits a resigned groove.